“Behold, I give you the authority to trample on serpents and scorpions, and over all the power of the enemy, and nothing shall by any means hurt you. Nevertheless do not rejoice in this, that the spirits are subject to you, but rather rejoice because your names are written in heaven.”(Luke 10:19‭-‬20 NKJV). “You shall tread upon the lion and the cobra, The young lion and the serpent you shall trample underfoot. “Because he has set his love upon Me, therefore I will deliver him; I will set him on high, because he has known My name. He shall call upon Me, and I will answer him; I will be with him in trouble; I will deliver him and honor him. With long life I will satisfy him, And show him My salvation.”(Psalms 91:13‭-‬16 NKJV). “And these signs will follow those who believe: In My name they will cast out demons; they will speak with new tongues; they will take up serpents; and if they drink anything deadly, it will by no means hurt them; they will lay hands on the sick, and they will recover.”(Mark 16:17‭-‬18 NKJV). EVIDENCE OF A CHILD OF GOD WALKING,AND LIVING UNDER THE POWER OF THE HOLY SPIRIT . “And the prayer of faith will save the sick, and the Lord will raise him up. And if he has committed sins, he will be forgiven. Confess your trespasses to one another, and pray for one another, that you may be healed. The effective, fervent prayer of a righteous man avails much. Elijah was a man with a nature like ours, and he prayed earnestly that it would not rain; and it did not rain on the land for three years and six months. And he prayed again, and the heaven gave rain, and the earth produced its fruit”. (James 5:15‭-‬18 NKJV). “My son, do not forget my law, But let your heart keep my commands; For length of days and long life And peace they will add to you. Let not mercy and truth forsake you; Bind them around your neck, Write them on the tablet of your heart, And so find favor and high esteem In the sight of God and man. Trust in the Lord with all your heart, And lean not on your own understanding; In all your ways acknowledge Him, And He shall direct your paths. Do not be wise in your own eyes; Fear the Lord and depart from evil. It will be health to your flesh, And strength to your bones. Honor the Lord with your possessions, And with the firstfruits of all your increase; So your barns will be filled with plenty, And your vats will overflow with new wine. My son, do not despise the chastening of the Lord , Nor detest His correction; For whom the Lord loves He corrects, Just as a father the son in whom he delights. Happy is the man who finds wisdom, And the man who gains understanding; For her proceeds are better than the profits of silver, And her gain than fine gold. She is more precious than rubies, And all the things you may desire cannot compare with her. Length of days is in her right hand, In her left hand riches and honor”. (Proverbs 3:1‭-‬16 NKJV). -Through Christ we have been graced with the God given ability,where by we can do all things. Our problem, is that some of us are ignorant of this God given ability in us. -When you do what God has placed in your heart ,it will make changes for the better in your life and the lives of others. -Follow your heart. God’s way of communicating with us, is Spirit to spirit or Heart to heart. -Do not let anything get between you and God. -Anyone or anything that tries to get between you and God is someone or something that is trying to be your God. There are many types of prayer. Below are several main categories of prayer. A person may pray one or all of these in a single prayer time, and in any order. 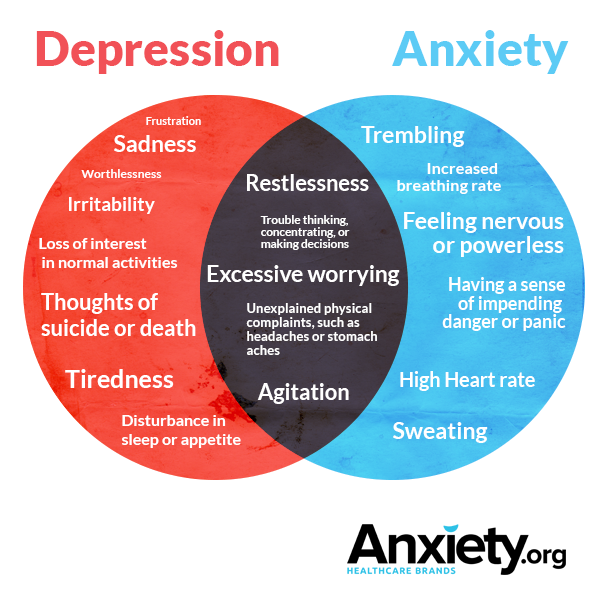 You can remember these categories with the acronym ACTS…. Prayer, first and foremost, ought to be about worship. God alone is worthy of undiluted praise. That would be true even if God never gave us a thing, and that is why adoration is distinct from thanksgiving. Notice that the Lord’s Prayer  begins with “ “Our Father in heaven, Hallowed be you name”(Matthew 6:9). Holding up God’s Name for praise for is our prime duty in prayer. Examples : 1 Chronicles 29:10 ; 2 Chronicles 6:26-27; Luke 2:37.. I say let’s BE RELENTLESS in prayer we got work to do in prayer. Teach us to prayer more in adoration keeping us effective in the area of prayer. 2 Chronicles 7:14; Daniel 9:4-9 ;; 1 John 1:8-9. 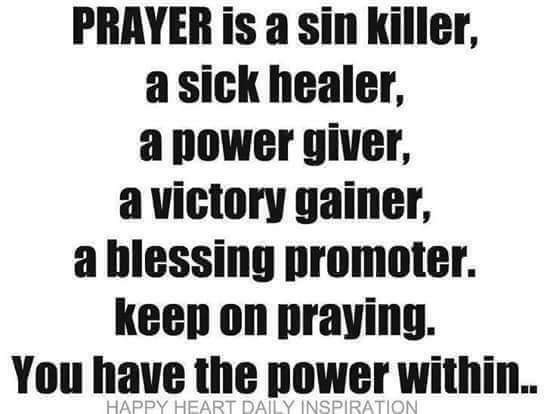 I say let’s BE RELENTLESS in prayer . Our Father which art in heaven, Hallowed be thy name, Thy Kingdom Come Thy will Be done ✅, in earth  as it is in heaven.God help to us to confess all sins and repent daily so we stay in righteousness. Continually pray it’s how we communicate with God. Our Heavenly Father wants his children to bring their requests to him ( Philippians 4:6 ). Jesus taught, Matthew 7:11- “ If you, then, though you are evil, know how to give good gifts to your children, how much more will your Father in heaven give good gifts  to those who ask him”. Intercession is a type of supplication where we pray for the needs and concerns of others. And we should not just pray for our friends, but also “ …pray for those who persecute you” as stated according to Matthew 5:44. 1 Samuel 7:8. I say let’s BE RELENTLESS in prayer  we got work to do. Our Father which art in heaven, Hallowed be thy name, Thy Kingdom Come Thy will Be done ✅, in earth  as it is in heaven. ABBA Father we ask that your Holy Spirit Release Revelation knowledge unto us so that we may effectively pray for the needs and concerns of others as well as ourselves. Use us as mighty Intercessors for the Kingdom Of God doing the Work Of The Ministry. Anoint us daily with the refilling your power to do everything from God’s point of view. Jesus took time to pray to God the Father, Jesus “often withdrew to lonely places and prayed”(Luke 5:16) and he would pray for long stretches of time (Luke 6:12). “Be anxious for nothing, but in everything by prayer and supplication, with thanksgiving, let your requests be made known to God; and the peace of God, which surpasses all understanding, will guard your hearts and minds through Christ Jesus. Finally, brethren, whatever things are true, whatever things are noble, whatever things are just, whatever things are pure, whatever things are lovely, whatever things are of good report, if there is any virtue and if there is anything praiseworthy—meditate on these things. The things which you learned and received and heard and saw in me, these do, and the God of peace will be with you”. (Philippians 4:6‭-‬9 NKJV). Jesus said, “Ask and you will receive, and your joy will be complete” in John 16:24. Similar statements are found in Matthew 7:7; 21:22; Mark 11:24; Luke 11:9; and John 15:7. Is this a blanket promise with no conditions? If we ask for three hundred pounds of chocolate delivered to our door, is God obligated to give it to us? Or are Jesus’ words to be understood in light of other revelation? If we assume that “ask and you will receive” means “ask for anything you want and I’ll give it to you,” then we have turned the Lord into a cosmic genie who serves our every whim. This is the problem of prosperity gospel and word of faith teachings. In the Sermon on the Mount, Jesus says that whoever asks receives, whoever seeks finds, and whoever knocks will find an open door (Matthew 7:7–8). But with this and all other verses we must examine the context. Jesus goes on to say that God will not fail to give His children good things (verse 11). So, this is one condition to the promise of “ask and receive”: what we ask for must be good in God’s estimation. God will give advantageous gifts to His children; He will not give us bad or injurious things, no matter how much we clamor for them. The best example of a good gift is the Holy Spirit, according to Luke 11:13. We begin to see a two-fold purpose of prayer—to increase our understanding of what God calls “good” and to cultivate a desire in us for what is good. Our prayers to God are not unlike our requests of men. Our prayers are based in a relationship, as Jesus points out in Matthew 7:8. If a child asks his father for something the father knows to be hurtful, the request is denied. The child may be frustrated and unhappy when he doesn’t get what he asked for, but he should trust his father. Conversely, when the child asks for something that the father knows is beneficial, the father will provide it eagerly because he loves his child. We have another condition to the promise of “ask and receive” in John 14:14, “You may ask me for anything in my name, and I will do it.” Here, Jesus does not promise His disciples anything and everything they want; rather, He instructs them to ask “in my name.” To pray in Jesus’ name is to pray on the basis of Jesus’ authority, but it also involves praying according to the will of God, for the will of God is what Jesus always did (John 6:38). This truth is stated explicitly in 1 John 5:14, “If we ask anything according to his will, he hears us.” Our requests must be congruent with the will of God. The promise of “ask and receive,” even with its conditions, can never disappoint. There is no chance of things we need not being in God’s will. He promises to supply what we need when we “seek first his kingdom and his righteousness” (Matthew 6:33). Of course, what we want is not always what we need. If what we want is not in God’s will, then we really don’t want to receive it. God knows what is good for us and is faithful and loving to say “no” to selfish and foolish prayers, no matter how much we want what we’re asking for. God will always give us good things. Our job is to understand what is good, so that we know what to ask for. The natural mind cannot understand this. But, when we offer ourselves as “a living sacrifice” and are transformed by the renewing of our minds, then we “will be able to test and approve what God’s will is—his good, pleasing and perfect will” (Romans 12:1–2). Then, asking for what we need in faith, we will have all we need for life and godliness and fullness of joy (John 16:24). The biblical instruction concerning prayer is that we pray for the good things that we truly need, according to the will of God, in the authority of Jesus Christ, persistently (see Luke 18:1), unselfishly (see James 4:3), and in faith (see James 1:6). In Matthew 21:22 Jesus again emphasizes faith: “If you believe, you will receive whatever you ask for in prayer.” Those who truly believe God will witness the amazing, infinite power of God. However, comparing Scripture with Scripture, we know that the asking must be done within the will of God. Part of having faith is acceding to God’s plan as best. If we ask for healing, and that is the best thing for us, we should not doubt that God will heal us. If He does not heal, then not being healed is a necessary part of a larger plan—one that is ultimately for our good. Consider Psalm 37:4: “Delight yourself in the Lord and He will give you the desires of your heart.” This verse does not give us a way to manipulate God; nor does it mean that, if we obey, He will reward us with whatever treat we crave. Rather, it means that, when we delight ourselves in God, then we will find everything we want and need in Him. The key here is that the heart of the seeker is changed—when we delight in the Lord, God’s desires begin to become our own. When our desires match God’s, then our prayers are automatically aligned with His will. Among the most important prayers in the life of a Christian are “Teach me to love you above all else” and “Cause me to want what you want.” When we truly desire God, when we are passionate to see His will accomplished in this world, and when we ask for what brings Him glory, He is eager to give us anything we ask for. Sometimes the things that glorify God are pleasant—a marriage or a child. Sometimes they are difficult for us—a failure that humbles us or a physical weakness that makes us more dependent upon God (see 2 Corinthians 12:7). But, when we pray within His will, in the authority of Jesus, persistently, unselfishly, and in faith, we will receive what we need. (written by Mike Bryant). “I charge you therefore before God and the Lord Jesus Christ, who will judge the living and the dead at His appearing and His kingdom: Preach the word! Be ready in season and out of season. Convince, rebuke, exhort, with all longsuffering and teaching. For the time will come when they will not endure sound doctrine, but according to their own desires, because they have itching ears, they will heap up for themselves teachers; and they will turn their ears away from the truth, and be turned aside to fables. But you be watchful in all things, endure afflictions, do the work of an evangelist, fulfill your ministry”. (2 Timothy 4:1‭-‬5 NKJV). 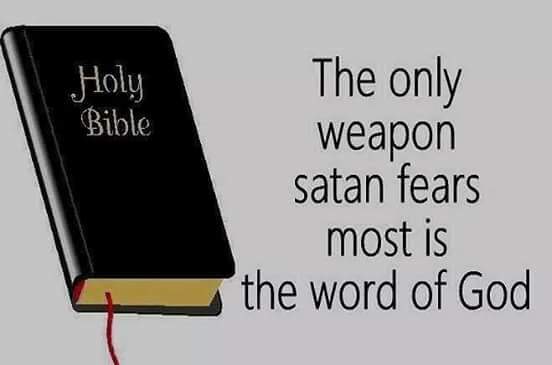 “For the word of God is living and powerful, and sharper than any two-edged sword, piercing even to the division of soul and spirit, and of joints and marrow, and is a discerner of the thoughts and intents of the heart. And there is no creature hidden from His sight, but all things are naked and open to the eyes of Him to whom we must give account. Seeing then that we have a great High Priest who has passed through the heavens, Jesus the Son of God, let us hold fast our confession. For we do not have a High Priest who cannot sympathize with our weaknesses, but was in all points tempted as we are, yet without sin. Let us therefore come boldly to the throne of grace, that we may obtain mercy and find grace to help in time of need”. (Hebrews 4:12‭-‬16 NKJV). “So when they had eaten breakfast, Jesus said to Simon Peter, “Simon, son of Jonah, do you love Me more than these?” He said to Him, “Yes, Lord; You know that I love You.” He said to him, “Feed My lambs.” He said to him again a second time, “Simon, son of Jonah, do you love Me?” He said to Him, “Yes, Lord; You know that I love You.” He said to him, “Tend My sheep.” He said to him the third time, “Simon, son of Jonah, do you love Me?” Peter was grieved because He said to him the third time, “Do you love Me?” And he said to Him, “Lord, You know all things; You know that I love You.” Jesus said to him, “Feed My sheep”. (John 21:15‭-‬17 NKJV). 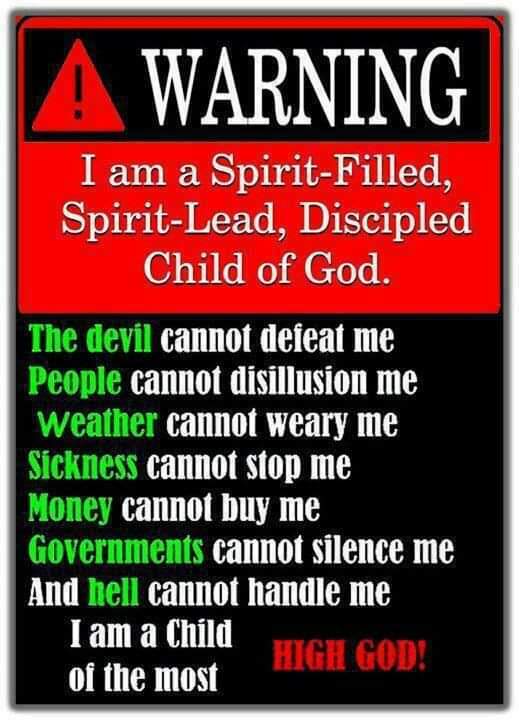 “And my speech and my preaching were not with persuasive words of human wisdom, but in demonstration of the Spirit and of power, that your faith should not be in the wisdom of men but in the power of God. However, we speak wisdom among those who are mature, yet not the wisdom of this age, nor of the rulers of this age, who are coming to nothing. But we speak the wisdom of God in a mystery, the hidden wisdom which God ordained before the ages for our glory, which none of the rulers of this age knew; for had they known, they would not have crucified the Lord of glory. But as it is written: “Eye has not seen, nor ear heard, Nor have entered into the heart of man The things which God has prepared for those who love Him.” But God has revealed them to us through His Spirit. For the Spirit searches all things, yes, the deep things of God. For what man knows the things of a man except the spirit of the man which is in him? Even so no one knows the things of God except the Spirit of God. Now we have received, not the spirit of the world, but the Spirit who is from God, that we might know the things that have been freely given to us by God. These things we also speak, not in words which man’s wisdom teaches but which the Holy Spirit teaches, comparing spiritual things with spiritual. But the natural man does not receive the things of the Spirit of God, for they are foolishness to him; nor can he know them, because they are spiritually discerned. But he who is spiritual judges all things, yet he himself is rightly judged by no one. For “who has known the mind of the Lord that he may instruct Him?” But we have the mind of Christ”. ( 1 Corinthians 2:4‭-‬16 NKJV). ““Therefore I say to you, do not worry about your life, what you will eat or what you will drink; nor about your body, what you will put on. Is not life more than food and the body more than clothing? Look at the birds of the air, for they neither sow nor reap nor gather into barns; yet your heavenly Father feeds them. Are you not of more value than they? Which of you by worrying can add one cubit to his stature? “So why do you worry about clothing? Consider the lilies of the field, how they grow: they neither toil nor spin; and yet I say to you that even Solomon in all his glory was not arrayed like one of these. Now if God so clothes the grass of the field, which today is, and tomorrow is thrown into the oven, will He not much more clothe you, O you of little faith? “Therefore do not worry, saying, ‘What shall we eat?’ or ‘What shall we drink?’ or ‘What shall we wear?’ For after all these things the Gentiles seek. For your heavenly Father knows that you need all these things. But seek first the kingdom of God and His righteousness, and all these things shall be added to you. Therefore do not worry about tomorrow, for tomorrow will worry about its own things. Sufficient for the day is its own trouble”. (Matthew 6:25‭-‬34 NKJV). “Be anxious for nothing, but in everything by prayer and supplication, with thanksgiving, let your requests be made known to God; and the peace of God, which surpasses all understanding, will guard your hearts and minds through Christ Jesus. Finally, brethren, whatever things are true, whatever things are noble, whatever things are just, whatever things are pure, whatever things are lovely, whatever things are of good report, if there is any virtue and if there is anything praiseworthy—meditate on these things. The things which you learned and received and heard and saw in me, these do, and the God of peace will be with you”. (Philippians 4:6‭-‬9 NKJV). “The thief does not come except to steal, and to kill, and to destroy. I have come that they may have life, and that they may have it more abundantly”. (John 10:10 NKJV). “Cast your burden on the Lord , And He shall sustain you; He shall never permit the righteous to be moved”. (Psalms 55:22 NKJV). “For though we walk in the flesh, we do not war according to the flesh. For the weapons of our warfare are not carnal but mighty in God for pulling down strongholds, casting down arguments and every high thing that exalts itself against the knowledge of God, bringing every thought into captivity to the obedience of Christ, and being ready to punish all disobedience when your obedience is fulfilled”. (2 Corinthians 10:3‭-‬6 NKJV). “casting all your care upon Him, for He cares for you. Be sober, be vigilant; because your adversary the devil walks about like a roaring lion, seeking whom he may devour. Resist him, steadfast in the faith, knowing that the same sufferings are experienced by your brotherhood in the world. But may the God of all grace, who called us to His eternal glory by Christ Jesus, after you have suffered a while, perfect, establish, strengthen, and settle you. To Him be the glory and the dominion forever and ever”. Amen. (1 Peter 5:7‭-‬11 NKJV). The thing they thought would kill you,made you stronger,YOU’RE AN OVERCOMER. They said you wouldn’t become nothing , but you have it all,YOU’RE AN OVERCOMER . If you were sick,and get healed ,then YOU’RE AN OVERCOMER. If you were in a car accident, and the car was totalled ,but you walk away , YOU’RE AN OVERCOMER. If you were unemployed ,and get a job,that you weren’t qualified for , then YOU’RE AN OVERCOMER . ARE YOU A OVERCOMER ? WHAT MAKES YOU AN OVERCOMER ? “You are of God, little children, and have overcome them, because He who is in you is greater than he who is in the world. They are of the world. Therefore they speak as of the world, and the world hears them”. (1 John 4:4‭-‬5 NKJV). “And they overcame him by the blood of the Lamb and by the word of their testimony, and they did not love their lives to the death”. (Revelation 12:11 NKJV). “He who overcomes shall inherit all things, and I will be his God and he shall be My son. But the cowardly, unbelieving, abominable, murderers, sexually immoral, sorcerers, idolaters, and all liars shall have their part in the lake which burns with fire and brimstone, which is the second death.”(Revelation 21:7‭-‬8 NKJV). “These things I have spoken to you, that in Me you may have peace. In the world you will have tribulation; but be of good cheer, I have overcome the world.”(John 16:33 NKJV). “Have you not known? Have you not heard? The everlasting God, the Lord , The Creator of the ends of the earth, Neither faints nor is weary. His understanding is unsearchable. He gives power to the weak, And to those who have no might He increases strength”. (Isaiah 40:28‭-‬29 NKJV). “O LORD, our Lord, how excellent is thy name in all the earth! who hast set thy glory above the heavens. Out of the mouth of babes and sucklings hast thou ordained strength because of thine enemies, that thou mightest still the enemy and the avenger. When I consider thy heavens, the work of thy fingers, the moon and the stars, which thou hast ordained; What is man, that thou art mindful of him? and the son of man, that thou visitest him? For thou hast made him a little lower than the angels, and hast crowned him with glory and honour. Thou madest him to have dominion over the works of thy hands; thou hast put all things under his feet: All sheep and oxen, yea, and the beasts of the field; The fowl of the air, and the fish of the sea, and whatsoever passeth through the paths of the seas. O LORD our Lord, how excellent is thy name in all the earth! (Psalm 8:1-9). +Only what God thinks about us really matters. +In God’s mind we are His beloved sons and daughters, kings and queens, lords and rulers, prophets and prophetesses and priests and priestesses. 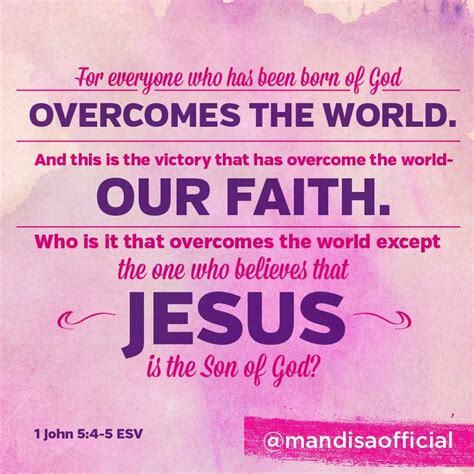 +In Christ Jesus God sees us as overcomers, victorious and more than conquerors. +We are wonderfully and fearfully made. We are greatly blessed, highly favored and deeply loved. +Yes, our God thinks more of us more than we can ever realize, and it’s all because He loves us. +Let us thank God for being Mindful of and keeping us in His Heart. Now unto the King eternal, immortal, invisible, the only wise God, be honour and glory for ever and ever. Amen. (1 Timothy 1:17).